Always wanted to take on a second instrument? 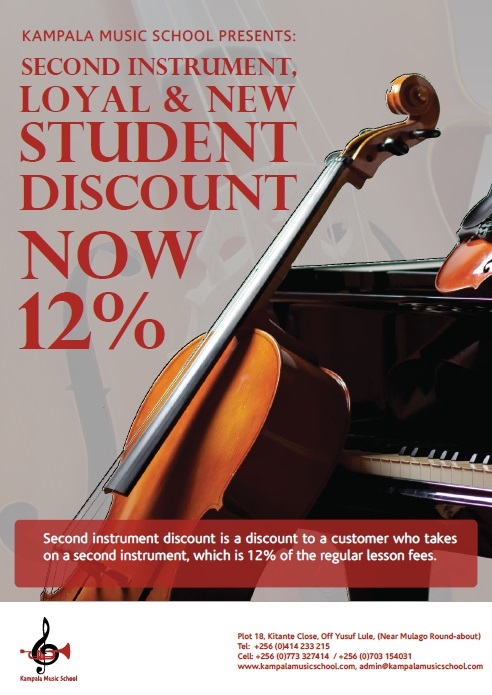 We are offering a great price for an additional instrument to your first to be paid for per term of lessons bought. This means that for 2 instruments of 30 mins you pay 550,000 (instead of 640,000), for 45 mins you pay 720,000 (instead of 820,000) and for 60 mins you pay 900,000(instead of 1,020,000). Other combinations are also possible. The longer you study both instruments the better you become at them and the better the discounts become over time. Fulfill your dream of having the ability to play in a band, ensemble, and even orchestra in due time. There is an additional holiday practice package for those taking on this offer for daily practice at KMS – offers you a chance to get even more done for each visit to the music school.